After some fine sunny days, when we got up early on Saturday to go to the Early Bulb Day, in Dunblane, it was blowing a blizzard. Some thirty miles south of Aberdeen there were no signs of snow at all. 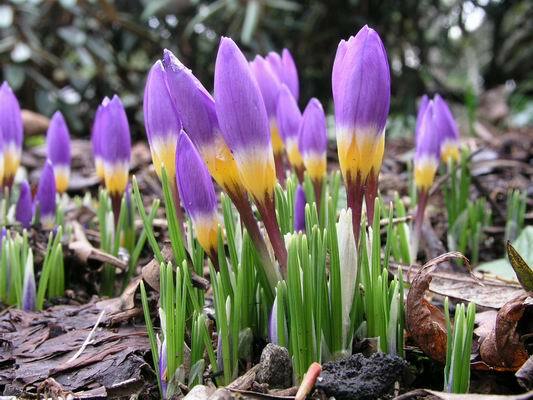 The forecasters are warning of a lot of cold weather and snow for two weeks, so, how are the bulbs faring? 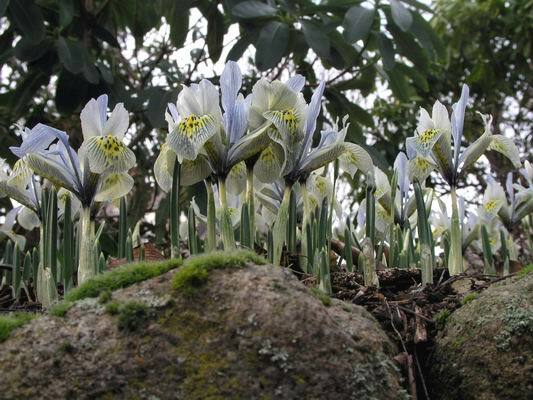 One day the bulb bed, with the Iris, was basking in sunshine and the next it was covered in snow. Luckily the days are bright and sunny and as the sun is climbing in the sky there is enough warmth to melt quite a bit of the snow during the middle of the day, otherwise we would have around 10cms lying all over the garden. This slightly raised bed gives me the opportunity to capture a worm's eye view of Iris 'Katharine Hodgkin' which as I have mentioned many times is not the least bit fazed by the cold and snow. 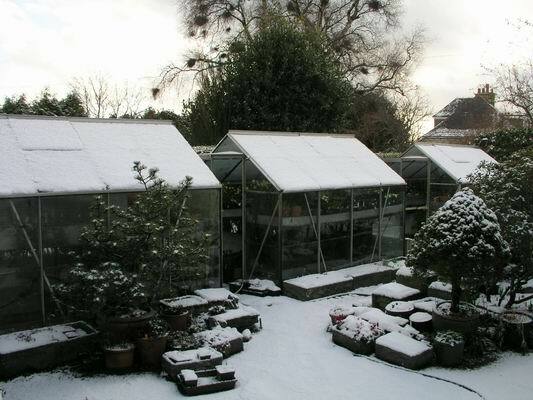 eek, the glasshouses have been covered in a light layer of snow. I like to remove this, to both let in as much light as possible as well as preventing too much of a build up the weight of which could easily collapse the light aluminium structure - and that would be a disaster. 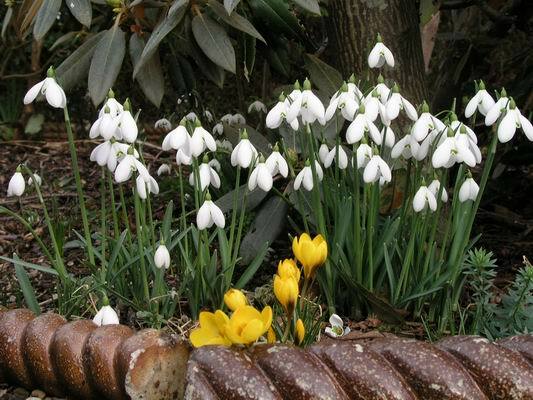 Many of the spring bulbs are well provided to cope with these cold conditions as they experience similar cold snaps in their native habitat as well as in cultivation. 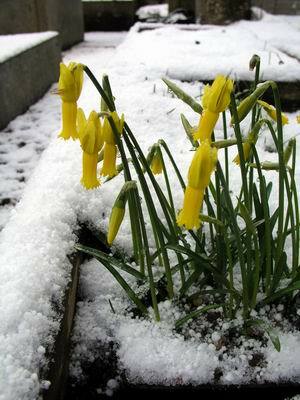 Narcissus cyclamineus looks perfectly happy surrounded by the snow. It makes me wonder if this type of weather condition has been the main influence on the evolution of the shape of the flowers of Narcissus cyclamineus. The narrow restricted tube keeps the important style and anthers protected from snow rain and, to an extent, cold. Under the protection of the bulb house one of my favourite forms of Narcissus asturiensis is this sub species vasconicus. 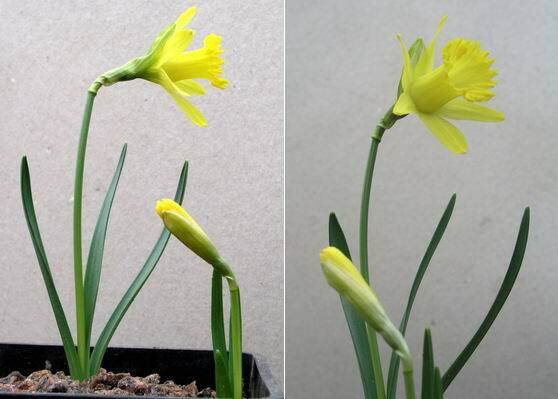 A short stem of no more than 5 cms is capped off with a perfect trumpet daffodil flower. I am very tempted to cross pollinate this to Narcissus cyclamineus as they produce very nice intermediate hybrids, but I also want to increase my stock of this sub-species so the hybridisation will have to wait. However I can (and will) take pollen from the asturiensis to the cyclamineus and make the cross that way. Crocus vitellinus OS1283 is closely related to C. olivieri and C. graveolens and could be easily confused, as I am when I read them up in Brian Mathew's wonderful book 'The Crocus'. The greatly divided thread-like style is fascinating and I just wonder what advantage a flower with a style as extreme as this could possibly have. I suppose, as there will be a stigmatic surface at the end of each thread, there is a greater chance of a bee rubbing against it with pollen rather than a single central style where the bee would have to hit the equivalent of the bulls eye rather than just hitting the dart board. This is an interesting pot of seedlings raised from Crocus chrysanthus albus seed. I am delighted that two out of the four that have flowered have turned out to be white as this is not always the case; for instance all the seedlings we have raised so far from 'Orla' the white form of Crocus nudiflorus have turned out to be blue/purple like the species type. 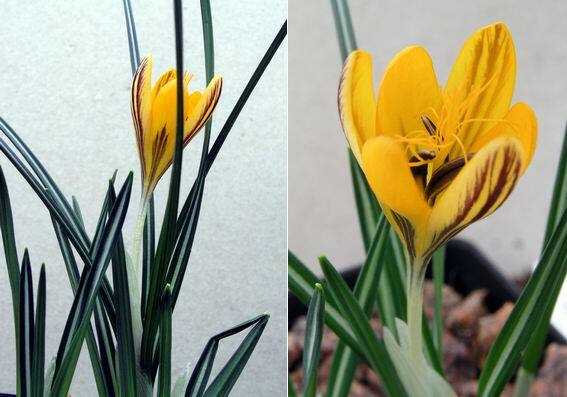 This is a neat form of Crocus vernus which we got as vittatus. It seems that it is just a synonym of vernus but as this species is so variable it is good to have a few names to hang on them. 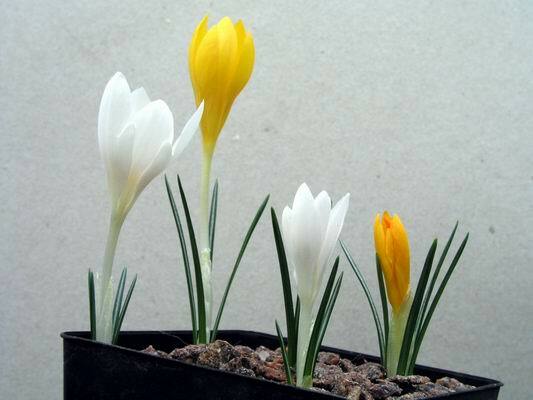 Now for one of those great success stories where a bulb, that not many years ago, cost several pounds per corm and is now sold cheaply in bulk packets in most garden centres, Crocus sieberi tricolour. I loved it when it was expensive and I love it even more now that it is cheap - it increases steadily in our garden. 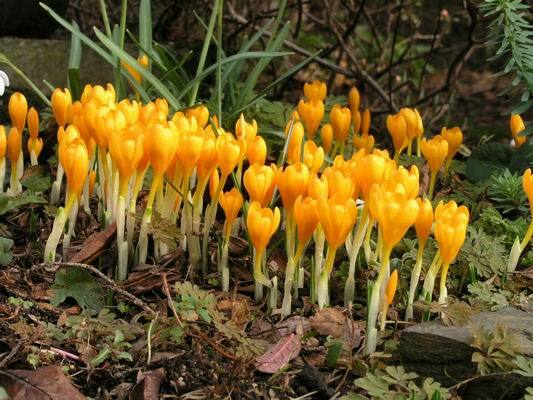 Another good growing garden crocus is the cheerful egg-yolk yellow, Crocus gargaricus. It is lover of cool moist humus-rich soils where it sends out stolons establishing satellite colonies as it moves around the beds. 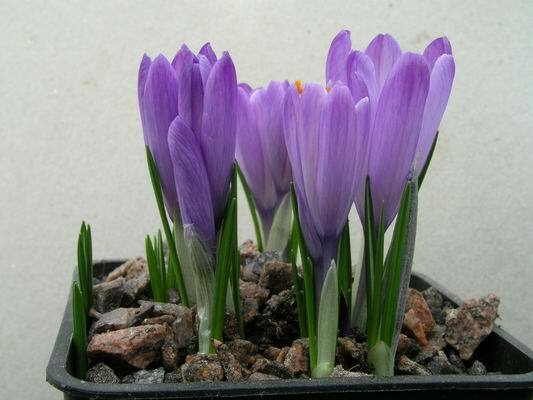 Of all the forms of crocus that we grow this species has the smallest corms; it is hard to believe that these small corms can flower but Crocus gargaricus really has 'naturally small corms'. Despite all my cheeky comments about Galanthophiles, I do like snow drops and we do have a lot of them around the garden. I just do not get as excited with them as I do with say Crocus or Erythroniums or Fritillaries or Narcissus or …….oops there I go again!! 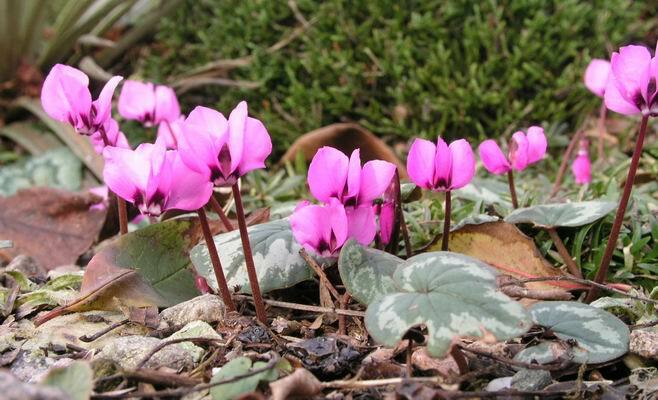 I have always been disappointed that Cyclamen coum has not done better in our garden. It is only recently when wondering why this is the case that I realised that all the Cyclamen coum we have came from seed collected during a single expedition by the cyclamen Society to Turkey. This is not a very wide genetic pool to try and establish such a plant in a very different climate and habitat to the one it is native to. With all the other bulbs that we grow in the open we have had several introductions from as wide a range of habitats as we could get our hands on. I have been rectifying this situation by getting other forms and sources of C. coum seed over the last few years and I now hope that we will see some of these establishing better in this cold corner of North east Scotland. 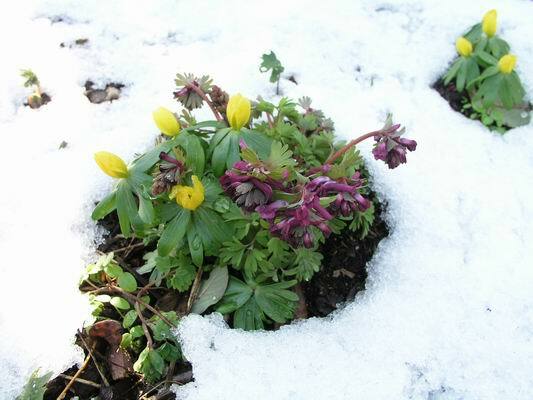 A nice little grouping of Eranthis and Corydalis, both self seeded, have created their own little nunatak. A nunatak is an area of land, usually a mountain top, that remained free of ice during the ice age and many believe that some of the relic species of plants survived the period of the ice ages on these. It is nice to see how nature can delight us by her own design, albeit with some help from us by introducing the original plants into the garden, with self seeded plants framed by the white of the snow.